Here's an exciting and upbeat a cappella version of the traditional spiritual combined with Beethoven's ever-popular tune from the Ninth Symphony. New seasonal lyrics for the Beethoven will be perfect for any winter concert! 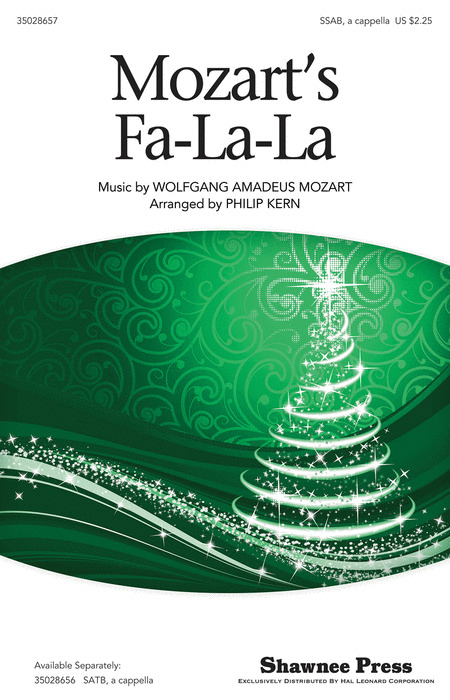 Take Mozart's Eine kleine Nachtmusik, add some lyrics from Deck the Hall, a feww ho-ho-hos and a lot of fa-la-las, arrange it for a cappella voices and you've got one fun-filled choral for the holidays. Absolutely delightful! The story of the manger in Bethlehem is told through a percussive text of no room and easy four-part, a cappella writing. The rhythmic setting can be performed with musical finesse and makes a terrific selection for young voices learning unaccompanied singing. The story of the manger in Bethlehem is told through an a cappella percussive text of no room in a new SAB voicing. The rhythmic setting can be performed with musical finesse and makes a terrific selection for young voices learning unaccompanied singing. Encouragement, determination and fundamental human rights sing out in this spiritual with the powerful line, You got a right to the tree of life! Sung with diverse range of vocal sound in a loose, gospel-like style, adding the optional percussion and solo builds the piece with intensity and drive throughout. Easy harmony and repetitive form make this an excellent choice in teaching culture and style. A cappella with optional percussion, this choral combines the familiar African Carol and The First Noel. Rhythmic with a musical intensity, this choral work arranged by Mark Burrows is simple to learn, yet full of musical style and learning opportunities. Try it as a processional or for that perfect second number in your holiday concert. It's also a wonderful opportunity for your students,teachers or parents to join in and play the optional rhythm instrument parts included with the choral. Available SATB, unaccompanied with percussion. This original, a cappella work sings of the star above Bethlehem shining to lead all to the gift of love and light. A tinge of Appalachian style can be heard in this vocal setting and should be embraced. Optional percussion is encouraged, bringing rhythmic life below the pulsed vocals. A perfect selection that fits nicely at any point during your program. This Victorian Age carol is exquisitely set by Greg Gilpin for a cappella voices. Its melody is elegantly simple with harmonies of a symphonic nature. A gorgeous selection for your holiday program. Available: SATB, a cappella. Duration: ca. 2:19. Jay Rouse continues to shine with a cappella vocal arranging with these three traditional carols that are associated with greeting the holiday season. Diverse in style, these can be sung as a set or individually. Pure choral joy! Available: SATB, a cappella. Duration: ca. 4:21. Three, short a cappella jazz arrangements within one choral is a fabulous find for the holidays! Ding Dong Merrily on High, Jingle Bells and Carol of the Bells have been creatively arranged in tempo and style by Jay Rouse. They are full of fun with a touch of challenge that pays off when mastering the wonderful harmonies and rhythms.